5G: A Revolution for Construction Connectivity | CCR, Inc.
A few years ago, 4G was the next big thing. It claimed to deliver speeds 10x faster than 3G, with a 6 Mbps download and 1 Mbps upload time. It served to resolve network congestion and speed issues that came with 3G, but now we’re on the cusp of another speed evolution: 5G. We’re not talking about the 5GHz Wi-Fi you can get in your home, and we’re not talking about 5G E either. (This article explains the differences between 5G, 5G E, and 5GHz.) We’re talking about 5G cellular connections. In fact, 5G is expected to be faster than 4G latency anywhere in the 60 to 120 times improved range. The trouble is that this technology is still living in a laboratory setting. Its predicted performance versus the actual output remains to be seen. The Internet of Things has shown tremendous potential on the construction jobsite. A blanket term that covers anything from simple sensors to complex wearable technology, IoT is limited in ability by the speed of its connections. Long delays between the device and the receiver reduce the speed with which these tools are implemented on-site. Why invest in something that doesn’t deliver as instantaneously as it claims to? Should 5G network connectivity be as great as it sounds, this could dramatically increase the implementation and rapid adoption of these devices on the jobsite. 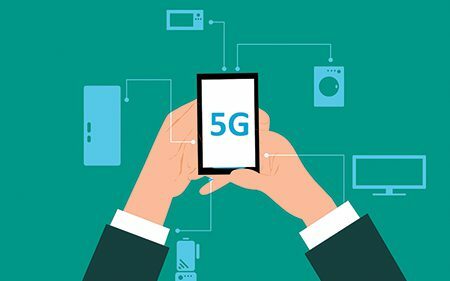 5G: The Holy Grail for Construction Connectivity? What will these new speeds cost? What kind of coverage will they have? How long will it take for that to expand? What is the potential output versus actual speed delivery? More efficient streaming data allows for multiple inputs and outputs making data upload and sharing faster than before. Real-time data will actually mean real-time data. Wireless infrastructure upgrades produce more resilient, reliable connections that won’t drop off or disappear without notice. Lower latency times mean better responsiveness for hands-on applications. Track your fleets reliably and manage your AR/VR/MR devices knowing that you’ll be getting the most from your tech while using them. More bandwidth means more mobile connections (up to 3 million more). 5G uses GaN devices, which withstand high-frequency switches, high voltages, and high temperatures. This is handy in construction settings where hot summer days or different projects may require quick changes to how the connections function. Find a connectivity specialist for your jobsite Wi-Fi. All that tech you’re using can’t function without the best connection. What is your business most excited for about 5G networks? Start a conversation with us on social media!